The natural environment of the Maltese Islands differs from the other European countries. Whereas most of them are rich in features such as mountains, forests, rivers or lakes, one will hardly find here. On the other hand, the islands’ landscape is dominated by cliffs, valleys, fields, rocks, beaches and bays. The cliffs can be found on the western side of both islands, sharply rising from the sea to heights of 80 to 130 meters above sea level and down to 80 meters below in some places. Due to the difficult accessibility, the cliffs are home to many unusual Mediterranean coastal habitats. Maltese fauna and flora definitely have plenty to offer for visitors to view and enjoy. So If you’re looking for things to do in Malta one of the must see is a natural trio of spectacular phenomena – the Azure Window, Inland Sea and Fungus Rock. They can be found in the same location and are spread over a space of a few meters from each other. If you also enjoy the more adventurous activities, Malta is the place for you. Unlike other countries, the Maltese Islands conceal many attractions under water. So whether it is snorkeling or diving that you prefer, the Mediterranean waters are host to the extraordinary underwater landscapes surrounding the islands. 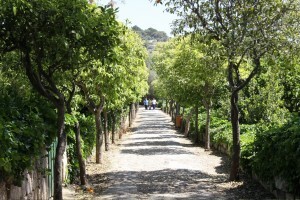 This countryside is an ideal site for walking; with views of Verdala Palace and Buskett Gardens or Filfla Island. The cliffs are few kilometers long and 200 meters high at some points and were the Island’s natural fortress during the Knights’ occupation. Dingli Cliffs is one of the most beautiful locations in Malta, especially at Sunset, when its charming and breathtaking views are unparalleled. This is one of the few woodland areas in Malta. The 30ha site lies south of Rabat and east of Dingli. There are many different trees and shrubs growing in the area. These gardens were originally planted by the Knights Hospitaler as a hunting ground. Nowadays, it is a beautiful place to go for a walk in winter or simply just hide in the shade from the sun. very limited number of the saline marshlands, a great importance is paid to this natural heritage. These sites are recognized as conservation areas. The Marsaxlokk Saline Marshlands were listed as Nature Reserve in 1983. They evolve in isolated area on sediments overplayed with surface water. It is a process which happens during the growth season. The distance between the sea and the Saline Marshland is very important as they are the link between the marine, freshwater and terrestrial environments. location throughout the year. KRM also offer a Heritage trail, which is an educational visitor programme for both students and adults. This walk along Manikata Rural Heritage Trail is a way for everyone to experience and learn about the Maltese nature and agriculture. Whilst viewing historical and archeological sites, taste local Maltese bread with olive oil and sun-dried tomatoes. You can also take an opportunity and purchase the local produce. Once in the locality you might want to consider visiting the Majjistral Nature and History Park which borders with the Manikata, and is known as the first Natural Park set up on the Maltese Islands. The beauty of the pure Maltese nature gives its visitors a rare experience in very developed Malta; of walking in history and wilderness. 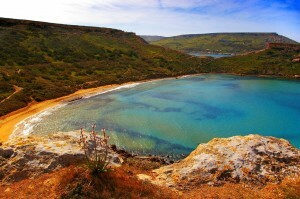 It is located in the Northwest Malta and includes the coastal area from Golden Bay to il-Prajjet and ix- Xagħra l-Ħamra. This park includes 6 km of designated Natura 2000 area, historical and archeological site. If you’re in love with nature or would like to enjoy some quiet time in typical Maltese gardens during your holidays in Malta, the Grand Hotel Excelsior offers some unique Malta Holiday Packages for your enjoyment. Browse through our inspirational holiday ideas. This entry was posted in About Malta, Country Walks in Malta, Gozo, Holidays in Malta, Malta, Malta Attractions, Malta Sightseeing, Maltese Islands, Things to do in Malta and tagged grand hotel excelsior malta, holidays in malta, malt aholiday packages, maltese countryside, maltese gardens, maltese islands, natural attractions, nature, things to do in malta, visiting malta on October 30, 2013 by Denise Camilleri. Once upon a time, in a far away land, there was a place beyond historical walls. It was a place full of joy and wonder surrounded by seas of the deepest blue and breathtaking views. Alice and her friends discovered this land of make-believe, a beautiful venue which they termed the New Wonderland. Hence it was decided that they would spend Christmas at the Grand Hotel Excelsior Malta. 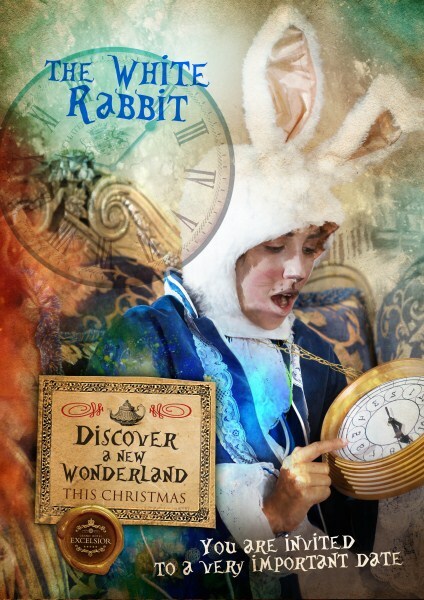 Celebrate the Christmas spirit with your family and friends at this New Wonderland. Call this superior 5 star Hotel in Malta on +356 21 250 520 or email christmasdesk@excelsior.com.mt for more information on how to Live the Grand Life this Festive Season! 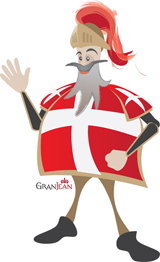 This entry was posted in About Malta, Christmas in Malta, Dining in Malta, Excelsior Hotel Malta, Feasts in Malta, Fine Dining in Malta, Holidays in Malta, Luxury Malta Hotel, Malta Events, Malta Restaurants, Maltese Traditions and tagged 5 star hotel in malta, christmas, grand hotel excelsior malta, sea views on October 28, 2013 by Denise Camilleri. 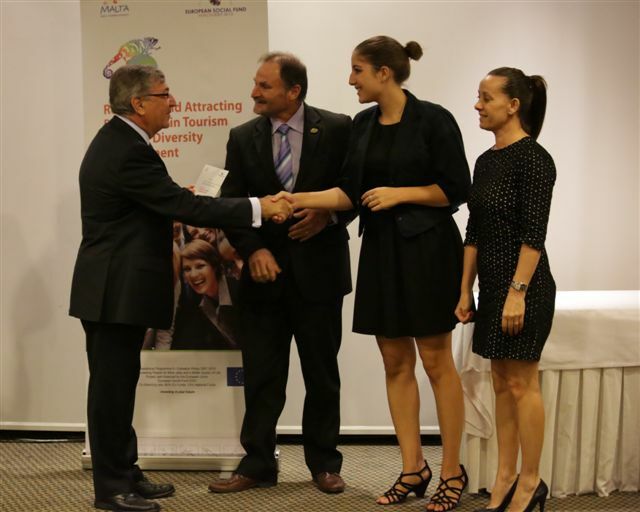 October 2013 Valletta, Malta –The Grand Hotel Excelsior has received the Tourism Diversity Employer Award from the Malta Tourism Authority, in recognition of its commendable diversity management policies and procedures. The award was presented by the Hon. Dr. Karmenu Vella, Minister of Tourism, to Alfred Attard, the Human Resources Manager, Michela Grixti, the Human Resources Coordinator and Donna Doyle, the Spa Manager, during the Diversity in Tourism Conference, which took place on the 1st and 2nd October at Le Meridien. The Grand Hotel Excelsior is ideally located on the doorstep of a UNESCO World Heritage Site – the City of Valletta, with all its major attractions, art treasures, and historical architectural gems. This acclaimed 5 star Hotel in Malta prides itself in providing the discerning traveller with magnificent accommodation, breathtaking views, state-of-the-art meeting rooms, and an unforgettable dining experience. This entry was posted in Excelsior Hotel Malta, Luxury Malta Hotel and tagged 5 star hotel in malta, accommodation, grand hotel excelsior malta on October 24, 2013 by Denise Camilleri.